There’s no doubt about it, the style and elegance of custom made drapery can’t be beat. 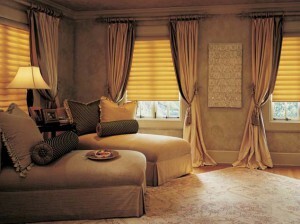 Soft window treatments bring a touch of elegance and style to any room. At Treasure Coast Window Fashions in Stuart, FL, our talented designers and seamstresses will help you create the perfect custom drapes, cornices, valances, top treatments, and more! Limitless options. With our extensive fabric library, combined with available trims, bands, and accessories, there’s really no limit to the originality of your custom drapery. Precise fit. Window sizes vary, and often ready-made drapes just simply don’t fit properly. Custom drapery design starts with precise measuring and ends with expert installation. Your custom soft window treatments will function perfectly. Please contact us at 772-220-8870 or visit our showroom in Stuart, FL, for more information about our custom drapery services.